Looking for the Real Thing? Purchasing an original is a big deal. Not only is the price demanding, but you're investing in something unique, one of a kind, fragile, and ultimately an asset to you and your legacy. Sounds deep, but art collecting truly is just that. My goal this year is to make my originals more obtainable to you. Throughout the year you will find them on Facebook in a photo album, here under Art for Sale, and hopefully soon on my website. 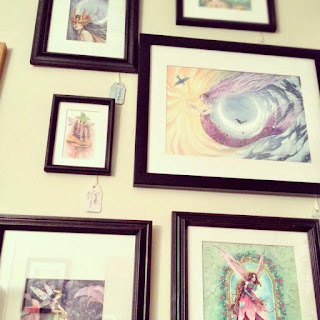 The blog is the simplest way to purchase an original. Visit Art for Sale (found at the top of this page), find the piece, and click Purchase. It goes through Paypal, and if that doesn't work for you, please Email me and we can make an arrangement. If you've ever done business with me, then you know I'll do whatever is in my abilities to make it work for you. Buying art isn't like buying something from the store, it's an investment...remember? I make that investment too by serving you, getting to know who you are, and if possible check in and see how that piece is working for you and your home. If you're interested in owning an original, but don't see one you'd like to purchase simply request a custom piece by visiting my Etsy shop and contacting me through the "Request custom item" link there, or email me. Please be sure to read these Policies first before you ask for a custom piece...as it should answer most of your questions. New works will be added often, so keep your eye on the Art for Sale page by bookmarking it!